A house burglar who stole treasured heirlooms and other property in a series of night-time break-ins has been jailed for more than three years. Stephen Paine, 39, pleaded guilty to three offences of house burglary when he appeared at Bradford Crown Court last week via a video link to Leeds prison where he had been remanded in custody. 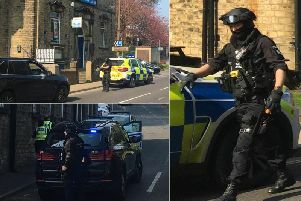 Paine, who had previous convictions for house burglary, was remanded after his arrest in connection with three break-ins in Halifax. The court heard that all three burglaries took place in the middle of the night while the householders were asleep. Prosecutor Alisha Kaye said during one of the attacks Paine stole a bracelet which had been handed down as an heirloom from the complainant’s late grandmother and mother. Paine, of Rothery Court, Crossley Gardens, Pellon, also snatched a watch which had been a 50th birthday present. In another burglary Paine took various property including a camera which contained personal photographs. Miss Kaye referred to victim impact statements in which the complainants described the effect of the break-ins. The woman whose jewellery and watch were stolen said she had been left “heartbroken” by the loss of the items which could never be replaced. Another victim couldn’t afford to buy a replacement key for their car and another said she felt disgusted that someone had been in her house. Paine’s solicitor advocate Rachim Singh said he had pleaded guilty within a month of the offending and realised he now face a significant jail sentence. He said Paine had started taking Class A drugs again and couldn’t fund that addiction through legitimate means. Mr Singh said Paine had apologised for the offences but that would be little comfort to the complainants. Jailing Paine for 40 months Judge Jonathan Rose said the stolen heirlooms would have been sold on for “a pittance” so that he could buy drugs. Judge Rose said Paine had an appalling record for violating people’s homes and stolen their property and memories while they slept in their beds.